On Sunday 25th August 2014, I went to the Seaburn classic and vintage vehicle rally. They had vehicles of all shapes and sizes, with most of the buses having been seen previously on this site. However, this is one I’ve never seen before. GSR 244 a Commer Q4, with C29F body by Scottish Aviation. It was new to Meffan of Kirriemuir in 1943. I assume the Perkins diesel was a later modification. Not a lot of detail I’m afraid, but an unusual vehicle. Ronnie, I think this Commer would be later than 1943. Whilst there were certainly some civilian Q4 lorries built from 1943 I don’t think there were any PSV applications until after the war. The immediate post war Commer Q4/Commando story is a little complicated. Basically, as I understand it, the Q4 was a goods chassis and at the end of the war the Rootes group were left with some surplus unsold Q4 chassis, possibly a cancelled government contract. Some of these chassis were then reworked to become suitable for PSV use and when this supply was exhausted further chassis were built to PSV standards and these were called Commando. Just what the difference was I have never been able to determine. GSR was an Angus registration, so that ties in with Kirriemuir, but was current between Nov 1949 and Feb 1951. The normal control Commando was superseded by the forward control version in 1950 so I suspect GSR 244 dates from early 1950 and is a Commando rather than a Q4. It may have had a later diesel conversion but the Perkins P6 was an option in these Commers from new. This was new in April 1950 with a Rootes 6 cylinder engine. 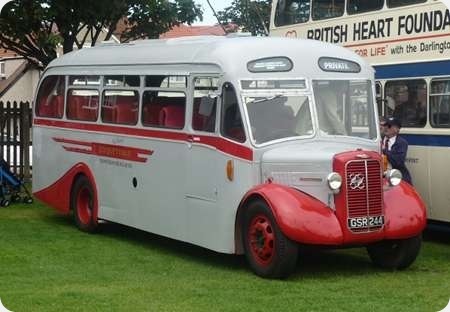 Further note this was an ex WD chassis dating from 1943 reconditioned and bodied in April 1950. Thanks for the chassis information Alan. That explains why it is a Q4 and not the Commando. It looks as if the Q4 and Commando ran alongside each other for much longer than I thought. In my message above I should have said the forward control version was of course the Avenger, and it appears the Avenger and Q4/Commando also overlapped by about a year. Thanks for that, Eric and Alan. I was going by the information displayed on the vehicle. However, my thoughts at the time were that the body looked to be to modern and well appointed to have been of 1943 vintage, so a rebodied wartime chassis would explain it. I wonder if anyone can point me in the direction of a photo of an RAF Commer Commando whilst it was actually in service with the RAF. I am trying to research a genuine registration number for a modelling project. There is a fine preserved vehicle in the Yorkshire Air Museum but it is carrying a post-RAF service civilian registration. Andy – The one in the Yorkshire Air Museum originally carried the registration RAF 138076. From 1949, when a new system of military registrations took place, it became 08 AC 67. So take your pick or build two models! Re the Meffans Commer coach. About 20 of these vehicles started life in 1946 as BEA one and a half deck airport coaches to run to Heathrow. They were replaced around 1949 and bought by Scottish Aviation who rebodied them and fitted recon 6 cyl side valve engines. Most were bought by Scottish operators including Meffan and Fern of Kirriemuir. Alexander took 20, one of them was used on the Pitlochry Kinloch Rannoch service I have first hand knowledge of the Kirriemuir ones as I drove both often. Andy, no doubt you will be aware that the Oxford Die-cast Company has brought out a model Commer Commando in 1:76 scale. Liveries include RAF, BEA, BOAC,Australian National Airways and soon to come, South African Airways. What a very handsome tidy and friendly looking little vehicle, with a bright but refined livery which suits it admirably. Having read with interest all your comments. I draw your attention to Alan Oxley and Isla Adamson comments which were gratefully received. Alan in stating new to Meffan with a Rootes 6 cylinder engine being ex War Department chassis from 1943 reconditioned and re-bodied in April 1950. Isla comment of, bought by Scottish Aviation re-bodied and fitted with 6 cylinder engine most of these coaches were bought by operators including Meffen, also Alexander took 20. I have come across a photo of GSR 244 showing the original owner to be Alexander of Falkirk information is along side that of current owner being Derek Thompson of Longframlington, Northumberland at time photo was taken. If you input GSR 244 to BLOTW under search the owner it does show to Meffan however if you select More it raises 12 photos of coach. 1 photo clearly shows original owner to be Alexander so here lies the confusion of new to Alexander or Meffan. A 2nd. Photo shows coach sold to a Falkirk firm ( ? Alexander) after service from War Department. Alexander or Meffan is no further trace until it was acquired by the late Ted Heslop of Acomb near Hexham in Northumberland in 1970 a scrap merchant / preservationist. Stripped to the chassis it was rescued in 2010 by Derek Thompson who re-bodied it with a Scottish Aviation body and a Perkins P6 engine. A 3rd. photo shows coach on rally circuit showing to WEST COACH MOTORS in Scotland whilst with Derek. Suffering in health Derek sold coach. In May 2015 see’s the coach return to Scotland present ownership Unknown as of 10/04/2016. GSR 244 is a 1943 Commer Q4 Ex. War Department chassis as in 1st.photo show’s it to have all Aluminium Bodywork by Scottish Aviation based in Glasgow. Alexander of Falkirk were coach builders around 1947/48/49 I ask could this coach have been built by them then listed as new to Meffan in 4/1950 or would anyone be able to confirm it went Meffan then Alexander. Any further history be gratefully accepted. Thank you to everyone for information up to this point. We’re in need of Occam’s razor here; the vehicle concerned was built in 1943 as a goods chassis, not a PSV, it was not at any time a BOAC vehicle. Walter Alexander & Sons Ltd (and subsidiary David Lawson Ltd ) did indeed run a batch of Commer Commandos with similar bodies; they and this coach were not however bodied by Walter Alexander but by the Prestwick, Ayrshire based company Scottish Aviation. 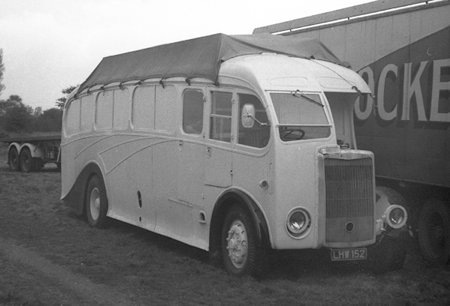 From 1946-51 with a decline in aircraft production they built all aluminium bus and coach bodies. 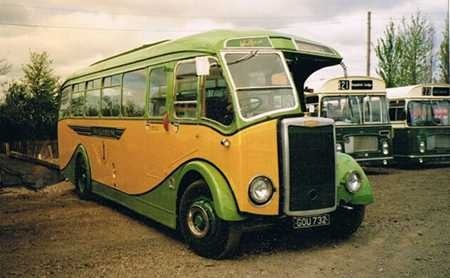 This particular coach body was fitted at Prestwick by Scottish Aviation and the coach sold to Meffan of Kirriemuir. It is not recorded as ever having worked either for the Walter ALexander companies or for West Coast motors in any source I have ever seen. Stephen Allcroft. Thank you for your detail I shall amend notes. GSR 244 never served with West Coast Motors, the pic of it on Flickr by ‘ASP8’ in West Coast Motors livery is a digital photo edit on what it might have looked like in WCM livery. The Chiltern Queens gallery contributed from Ray Soper has recently included references to the former Altonian Tilling Stevens. GOU 732 is a Tilling Stevens K6LA7 with a Scottish Aviation C33F body that was delivered to Altonian Coaches in 1949. The engine is a Gardner 6LW. It is seen here in the summer of 1970 in the rather startling Altonian livery. One wonders if this vehicle gave SELNEC PTE the "inspiration" (how the English language lends itself to irony) for its grotesque orange/white livery. Would you call it "Burnt Umber" and Cream? SELNEC was just Orange and White! Bizarre to see this posting. Altonian went under two or three years ago and the bones and entrails were divided between Wheelers of Southampton and Orange Coach Travel of Aldershot. By that time Altonian had an uninspired overall orange livery – identical with Orange C T – and the vehicles fitted in easily. The legacy to Orange C T included two Neoplan Cityliners on Dennis Javelin GX chassis – perhaps the most unreliable vehicles operated by either operator. Maybe I’m just gaudy but I thought the Altonian colour scheme looked nice! That bright apricot and cream would have cheered up many a dull day…but the styling does seem to be a little bit of a mismash with those low set headlights and drooping windscreen making the bus look sad but friendly. I wonder how long it survived after the modifications to the entrance began to fail! The good news is that GOU 732 survives in preservation. The last time I saw it (and rode on it!) was at a Heart of the Pennines running day quite a while ago and at that point it was painted in a fictional "Wulfrun Motor Services" livery of green and yellow. Does anybody know of any other preserved Tilling-Stevens PSVs from the post-war period? I seem to remember that there was a Plaxton bodied Express Mk II in preservation at one point. This was the mosel which received similar bodywork to Bedford SBs rather than a half-cab layout. 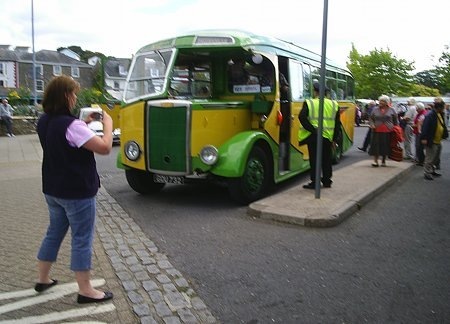 Yes, had a ride on this at the 2010 Kingsbridge 7 foot 6 inch running day, from Kingsbridge to Salcombe and back. It was in the fictitious Wulfrun livery. See the pictures below. As for this livery, it puts me in mind of the famous London Brighton and South Coast Railway loco livery, described (perhaps with tongue in cheek) as "Stroudley’s Improved Engine Green"! Have those with children/grandchildren noticed that’s its actually Bertie the Bus, Thomas the Tank Engine’s friend! Anyway- thanks for the picture of the well-fitting door! Roger has certainly got the hump over the SELNEC orange and white livery. While I admit it didn’t sit too well on the older half cabs, particularly where there was an exposed radiator, I thought it suited the newer rear engined vehicles quite well. On the basis that some of the other newly formed PTE’s simply adopted a variation of the livery of the largest operator, at least we in SELNEC land were spared Manchester’s ‘paint it all red’ livery! The colours used for the "Wulfrun" livery are the same shades as the former Wolverhampton Corporation livery hence the name! I always thought that SELNEC/GMT Orange and Cream was by far the best new PTE livery. [What about the horrendous South Yorkshire Coffee and cream?] Of course Stockport Red and Cream, Salford Green and Rochdale and Ashton Blue were preferable – but they would never have had a look anyway. Here is a photo of another Tilling Stevens coach, after disposal to a showman, but whether it is a K6LA7 (Gardner) or K6MA7 (Meadows) I know not, though the 6LW is more likely. The bodywork looks like a Strachans design, and the registration LHW 152 is a Bristol area plate. I took this picture on Mitcham Common in 1961. Can our experts come up with more information? LHW 152 was issued in October 1948 by Bristol CC so when Roger took that picture the coach was not that old but I will be interested to know whom the original operator might have been. No doubt it was lost many years ago as it does not appear on the DVLA records. My contacts in Bristol tell me that LHW 152 was new to A H Fielding (Empress Coaches) of Bristol, 4/49. TSM K6LA7, body is Strachan C33F. Withdrawn by them 2/60 and sold to a showman (Hill), Gloucester. I must have seen it in my school days! The Hill’s were big showground folk in the South West and Billy Butlin wed one of them before he launched his first holiday camp at Skegness. Geoff..thank you for the information. I recall Empress Coaches very well but not that particular coach. I also remember the Showman, Hills and am sure they used to hold circus shows around the Bristol area. The coach is most unlikely to have survived much into the 1970’s at best I suppose. GOU was at the King Alfred Running Day in Winchester a few years ago. The owner was telling me the livery is that of Wolverhampton corporation, applied in the style he thought they would have used had they gone in for coaches. I took this 20 odd years ago at the Outer Circle Rally (itself long defunct). I do not think it was very long after it was rebuilt and repainted from the old Altonian livery. It looked superb, but if it was like the other Scottish Aviation body that came to our body shop it must have been a real labour of love by Mr. Harris. David-do not wish your life away the Outer Circle photo was taken between 1998 and 2000. The fictional Wulfrun livery was applied in either 98 or 99. First, what a super website, I only found this by accident. 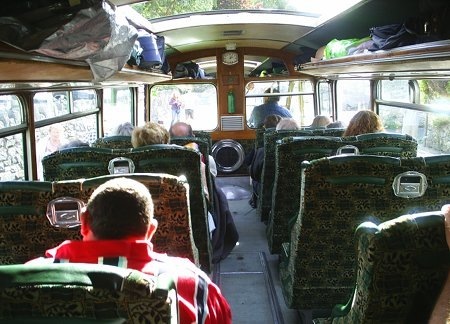 The TS, I believe, also spent some time with Classic Coaches of Wombourne, Staffs. I remember seeing this some years back dropping school children off in Kingswinford! I very much doubt if they realised just what a classic coach they were travelling on. The vehicle broke down last year on the way to the Wolverhampton event – fuel starvation and problems with the auto vac. It happened again on the way back from Statfold Barn Railway in March. Since then Roger has been working hard to sort out this problem and hopefully it will now be present at Wythall running day on May 4th. To make this magnificent Tilling-Stevens even uniquer (that’ll get the language purists going!) it has a 6-speed David Brown gearbox, replacing the original 5-speeder. Unless it’s been changed back since. I remember this TS well as it was my daily transport to school in the late 1970’s into the early 80’s. Recalled from the withdrawn from service row of old coaches kept at the Altonian Coaches depot (Warrens Transport) renovated and put back into service, this was mostly driven by Guy Warren. There was another coach of similar style in the row but this disappeared along with the six wheeler Duple bodied. 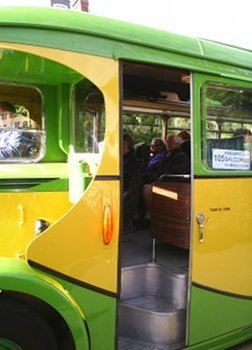 The TS always had a door at the front and as far as I recall, had green upholstery. Little known is its appearance in the St Trinians movie ‘The Belles of St Trinians’ (1955). 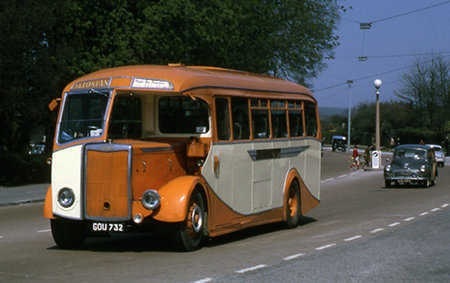 It always wore the Altonian colours of orange/cream which looked the part in the 70’s !! It still has green upholstery. Looking at David Gladwin comment the body is aluminium framed and has required minimal work to keep it functional. Issue has been a sticking autovac despite being renewed which means you sometimes have to clump it to keep fuel flowing.